Loghouse is proud to be part of Banteer pre-school project of 2017. The grand opening of two new log pre-school cabins were held at 9th of September. Red tape was cut by Michael Creed, the Minister for Agriculture, Food and the Marine. Loghouse had very short deadline of 3 weeks to build two new log pre-school cabins for their latest development project. We have successfully met all the regulations including adapting pre-schools for the disabled access, doors and bathrooms. 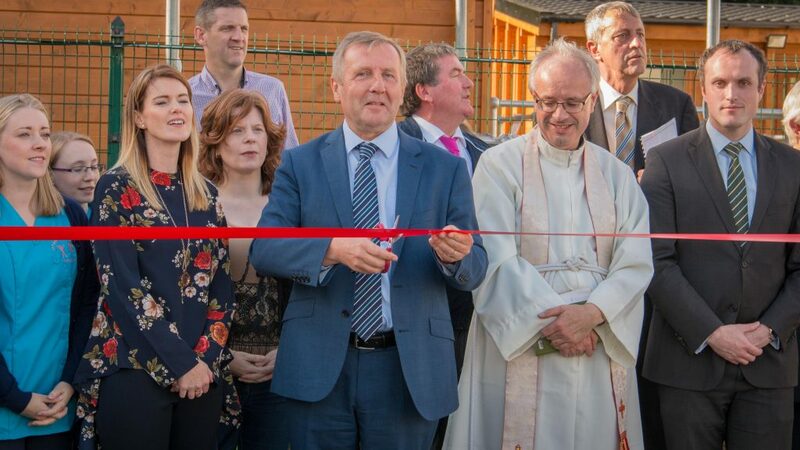 The childcare facility was built with grant aid of €1,300,000 and opened its doors to the public on 9th July 2007. Due to huge waiting list board applied for the full planning in 2015 for the big extension. Planning was granted same year. Required funds were €830,000 but at the time and now the funds were not available and board had to look at the plan B. In 2017 board have applied for the planning permission for two log cabins in April and planning was granted in May with Michael’s Creed help. The construction started on the first week of August. The log cabins were completed in 3 weeks from start to finish and ready to move in at the end of August. That included all: building disable walks, the plumbing, fire safety certification and fully kitting out the building by the end of August. The centre now has over 230 children registered and using the facility on a weekly basis. The service caters for babies, wobblers, toddlers, pre-school age, naíonra, breakfast club, and afterschool club. The centre is open from 7am to 7pm, 49 weeks of the year. Since 2007 the centre has grown dramatically and is now the largest employer in the Banteer area with up to 31 staff employed. The Centre encourages the children’s physical, linguistic, emotional, social and cognitive development by providing toys and equipment to enable play and education appropriate to their ages and abilities. Children participate in an environmental learning experience each year. The centre is extremely proud of the highly qualified team of dedicated staff members lead by Manager Mary Murphy. Staff members are constantly up skilling and taking part in various workshops and training. Courses are also provided in the centre making it more accessible for staff and parents as well as staff members from other crèches in the surrounding areas. The Centre Management and voluntary Board of Management also work very closely with other bodies such as Cork County Childcare Committee, IRD Duhallow, Early Childhood Ireland, FETAC, FÁS and St Joseph’s.